To register, please fill out the form below and click submit. You will need your Alumni number (in the format 8-********) to register. You can find this at the top of OT Extra (or any email from the Alumni Office), on your Oxford Alumni Card, on the latest address sheet of your Oxford Today magazine, or by contacting the University Alumni Office. Only alumni who were matriculated undergraduate or graduate students of St Cross College can register for this online service. You must agree to abide by our terms and conditions of use before an account can be opened for you. 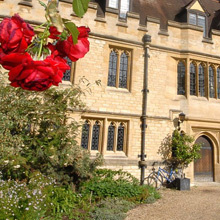 Before you register, please check that you have not already set-up an account with this site or one of the other Oxford Alumni Online communities. If you think you may have done but can't remember your password, please follow the forgotten password link on the login page.